True to its title, En el Séptimo Día (On the Seventh Day) begins with the sound of church bells tolling. As José, our main character, crosses himself and approaches the votive candle rack, his actions are cross-cut with those of his flatmates, who wrap their feet in athletic tape and polish cleats in a series of purposeful close-ups. This is as much weekly routine as it is ritual for the group, who represents their home city of Puebla, Mexico, in a Sunset Park soccer league. Games take place on Sundays, their only collective day off from work—José is a bicycle deliveryman for a Carroll Gardens restaurant, where some of his roommates also wash dishes; his other teammates are construction workers, custodians, and deli employees. Although this will be the only time we see José in a church sanctuary, this montage roots En el Séptimo Día in the variety of forms that spiritual sustenance can take. Writer/director Jim McKay’s fifth feature, and his first since 2005’s Angel Rodriguez, is his most tightly plotted film yet, propelled by a momentum that’s often exhilaratingly fleet. Yet his emphasis on his characters’ everyday stakes keeps the film from feeling lightweight, an investment that also distinguished his earlier New York dramas such as Girls Town (1996), Our Song (2000), and Everyday People (2004). The drama of the film hinges on a time-sensitive dilemma. The opening soccer match determines whether or not their team will qualify for the tournament’s finals, and ultimately they do, thanks to a decisive goal from José, their captain and star player. But they don’t emerge unscathed: one of their teammates, Artemio, hurts his knee after a near-collision with another player. An instinctual problem-solver, José proposes that they recruit a replacement for the finals, and also that Artemio, a cotton candy vendor, temporarily swap jobs with their roommate Félix, since washing dishes would not entail extensive walking. All seems doable until the next morning, when José explains the arrangement to his restaurant manager, Steve—although he begrudgingly accepts the employee switch, he insists that both José and Félix report to work on the following Sunday, the day of their final soccer game. José protests that he worked a seven-day week earlier in the month, and adds that he goes to church on Sunday mornings, but Steve, whose bread and butter is the Park Slope brunch clientele, explains that a private party is scheduled for that day and he needs as many people as possible to staff the kitchen. Based on the way his every word drips with smarmy entitlement, it’s clear that Steve views José as a unit of labor rather than a human being, but he cinches the deal by dangling the possibility of José’s advancement to busboy duty on the main floor. With soccer finals looming, José quietly takes it upon himself to create a contingency plan for the game, now that Puebla is possibly down three players—whether that means recruiting additional subs for the field, or figuring out a workaround at the restaurant. The seven-day deadline provides the narrative with a sturdy framework, giving the film a structural urgency familiar from a neorealist tradition stretching from Bicycle Thieves to the Dardennes’ Two Days, One Night. 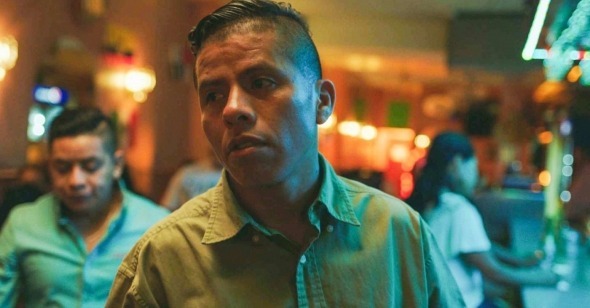 Yet McKay explores a different set of stakes: instead of jeopardizing José’s ability to work by pulling resources or infrastructure out from underneath him, the film forces him to reckon with the greater significance of his day off—and his right to it. Just as a bicycle can mean everything to one’s livelihood, a soccer game comes to embody the home that José and his fellow Pueblans have built in the United States, a way of preserving their cultural identity while bonding them to a diverse community of Brooklynites. As José weighs his options, he’s driven to contemplate the necessity of these support systems in a moment when financial security comes at the price of a pattern of exploitation. Although José is certain he could find another job fairly quickly, it’s possibly the worst moment for him to consider it: he was counting on using his upcoming vacation days to help his pregnant wife, Elizabeth, move from Mexico to New York so that their child will be born in the States. With a baby on the way, he would rather not start from scratch at a new workplace, or, in the event that he is unable to travel, risk the dangers of Elizabeth crossing the border with the aid of a Coyote. A moment of unexpected narrative import arrives during a midday break from deliveries. José stands on his bike and prepares a small taco for his lunch; McKay spends the duration of the quick meal with him, cutting from a wide shot into a close-up as José chews and silently strategizes. The scene is modest, but crucial—as in McKay’s earlier work, a seemingly ordinary moment is made emotionally acute by the context surrounding it. His second feature, Our Song, concludes with two similar long takes, each one focusing on a different principal character (Melissa Martinez and Kerry Washington, in her first film role) as she realizes that her life is irrevocably headed in a different direction. Their friendship will never be the same, but everything around them remains intact: McKay dials up ambient street noise, which seems to amplify the knowledge that these shifts catch one off guard without pomp or circumstance. By lingering with José, McKay uses his surroundings—an otherwise everyday Brooklyn sidewalk—to sharpen the significance of En el Séptimo Día’s sense of place. The film is filled with street scenes that are often storybook, sending José biking past brownstones and quaint churches at sunset, but this romanticism is countered by an understated but consistent focus on the hazards of life without documentation. McKay often folds these ideas matter-of-factly into the characters’ exchanges: late in the film, two of José’s roommates chuckle while describing how a third, Paco, fled from the police in a panic and, in the chaos, scattered the cotton candy he was selling on the ground; they aren’t sure if he managed to shake the police. In this context, this quiet interlude encourages reflection not only on José’s current predicament, but also on his ability to simply exist within a space. Clocking in at a brisk 92 minutes, En el Séptimo Día sometimes suffers from brevity; the secondary characters that make up the rhythm of José’s workday often play transparently functional roles and communicate through generic, pointed dialogue. The film builds a portrait of gentrified Brooklyn through the recipients of José’s deliveries, including an overworked art dealer, a no-nonsense bartender, and a snotty assistant at a tech company. McKay’s personalities are necessarily subordinate to the primary story, as opposed to a Brooklyn-based project like High Maintenance, in which grating oddball clients are the main event. Yet the tidiness of these characterizations comes off as vague when compared to his knack for behavioral detail through incident, such as when José loses part of his workday waiting on a startup employee who has ordered a delivery before he’s even arrived at his office; or when a receptionist switches from speaking in Spanish, as a gesture of solidarity, to English as soon as her supervisors are within earshot. McKay also includes Spanish subtitles for all English dialogue to equalize access for both Spanish- and English-speaking audiences. The unevenness of the characters somewhat undercuts its unifying argument for cultivating community—but, as on the day of the final match, community can arise on unexpected occasions. A bystander named Ray, a familiar face from the sidelines of last week’s game, helps Puebla with a goofy scheme to get José out on the field between deliveries (the development comes off as a little too neat, but mostly suits the plot’s breeziness). Ray’s help calls to mind a conversation José had with a priest earlier in the week: citing members of the parish who unionized at a local car wash, he urged José to seek out support networks instead of problem-solving in a vacuum. By investing his energy in advocates and allies, the priest advises, the rest will follow. The soccer game may be a small-scale pleasure—it would feel tonally off-key if José never made it onto the field—but its sacrifice would only perpetuate José’s dynamic with Steve instead of improving it. Despite the film’s overall streamlining, McKay locates a nuanced and insistent tension in micro-level decisions.